Photo: © National Garden Bureau, Inc. Used with Permission. It's large, it's purple and it's called eggplant? Actually, it's only called eggplant in the U.S., although Australians refer to eggfruit and in Africa, it's called a garden egg. In its native India, eggplant is known as brinjal and in the Mediterranean area, they are known as aubergines. Americans have never really understood eggplant. We're familiar with the large purple types. In fact, 'American Large Purple' was the name of a popular variety grown in late 19th century America. It took the home gardener and in particular, heirloom and ethnic gardeners, to bring other eggplants into prominence. Nowadays we are being tempted with fruits that are stripped, splotched or blushed with shades of violet. Some are even long and thin or small and round, in a rainbow of colors including pink, yellow, orange, green and even white. We admire them, but we still don't know what to do with them. We need to get the word out that eggplants have gone beyond parmigiana. That Americans call this vegetable "eggplant" should tip us off that the first varieties brought to the colonies were not large and purple. According to William Woys Weaver in his book Heirloom Vegetable Gardening, 'Old White Eggplant' was the earliest type to reach England, back in the 1500s. 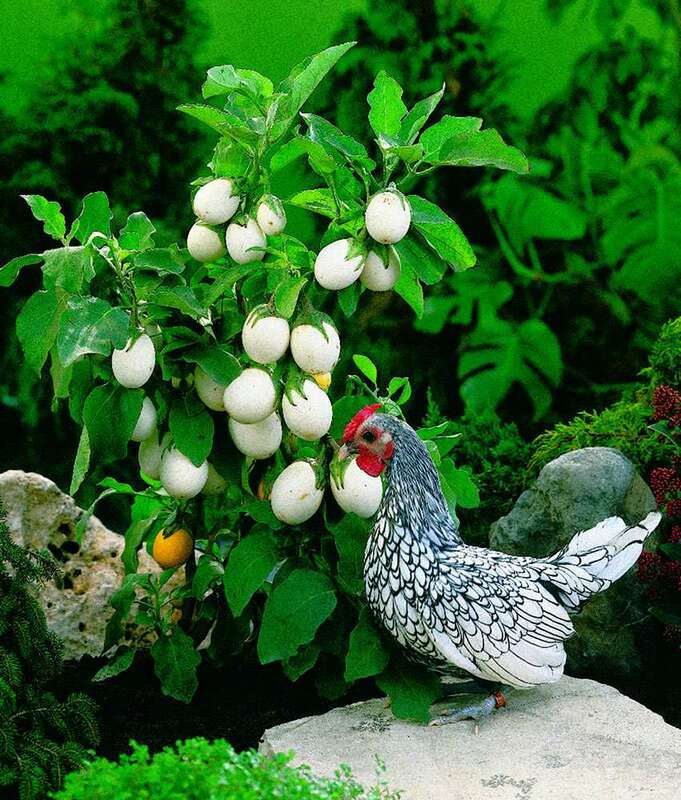 This was an ornamental variety with fruit that resembled a chicken egg. Eh voila! The British shared both the plant and its moniker with us. The small, white varieties are more of a novelty to grow but can be edible if harvested when very young. As they fully ripen, they turn a bright yellow. The National Gardening Bureau (NGB) has designated 2008 the Year of the Eggplant. You can visit the NGB at ngb.org. There are still white-skinned varieties in cultivation, particularly in Southeast Asia. More readily available here, 'Casper' is an elongated, white skinned variety that matures fairly early and has a mild, almost mushroom-like taste. White hybrids like 'Easter Egg' are also widely available in seed catalogs. We randomly pooled home gardeners both in person and on the web, to share their eggplant enthusiasm. We are happy to report that even in less than ideal climates, eggplant lovers are persevering. Although California and parts of the South have their pick of varieties and their harvests almost rival the most prolific zucchini, folks from Michigan to Maine voiced success with the shorter season Asian types. 'Pingtong Long' is a very sweet eggplant popular with many gardeners. It might also be familiar to you if you frequent Asian markets. We've had great success with 'Thai Long Green'. Besides growing well in our zone 5b garden, its texture holds up well when cooked and it can withstand a light frost. Similar American varieties to try are 'Louisiana Long Green' or 'Green Banana'. Shown here is the 2008 AAS winner 'Hansel'. 'Hansel' features finger length fruits that grow in clusters. The fruit has very little seed and the plant is compact enough to be grown in containers, which means you can start it early. Even in warm climates, eggplants are not the easiest vegetable to grow well. The seeds of eggplant are slow to germinate and develop, much like peppers. We start seeds in February and don't set them out until the end of May. Natives of tropical Asia, eggplants only thrive in truly hot temperatures. Many of us can provide hot, sunny days, but nighttime temps also need to stay above 50 degrees F. That's one reason they shine in the Mediterranean area and Southeast Asia. Similarly 'Rosa Bianca', a plump, white and lavender streaked fruit, has become something of a poster vegetable for the heirloom gardener. But it is difficult to grow in cooler regions. 'Rosa Bianca' is known for its incredible delicate, non-bitter flavor. Another heat lover, 'Violetta di Firenze', with large, fat, lavender fruits striped in white, can be less sweet if grown in cooler areas. Asia, Europe, and even Africa have had a more varied history with eggplants and have provided us with some of the best varieties. 'Calliope' is a stunning little oval, white and purple-streaked Indian-style eggplant. 'Calliope' does well even in cooler climates and is flavorful picked either young (2") or fully mature (3-4"). It is also spineless. If you prefer the traditional pear-shaped eggplant and your garden on the fringe of eggplant climate, you can try 'Twinkle'. Even smaller than 'Hansel' 'Twinkle' grows to only about 2'. The oval fruits are deep plum sponged with cream and are at their best harvested while immature (2 to 2 ½"long), so you don't need a long season. And it's spineless! India and much of Southeast Asia have made eggplant a standout in their cuisines and grow and use dozens of varieties. 'Kermit' is a hybrid version of Thai round eggplant. It produces small round fruits, only about 1 ½ in diameter. As you can see, the skin is a swirled green and white. We have not tried these yet, but we told you can eat them fresh or cooked. Just don't mistake them for an apple. While there is great variety among the eggplants in the species S. melongene, some of the more unusual eggplants are in the tomato fruited species, S. integrifolium. These are red and orange fruited plants often grown in Asia and Africa. One gaining popularity in America is listed as 'Turkish Eggplant' or 'Turkish Italian Eggplant'. The flesh is softer than S. melongene, more like a tomato, and the fruits only grow to about 2" in diameter. I've often seen them described as being somewhat bitter, but our local Extension agent strongly disagrees and is going to prove their sweetness to me this summer. We're looking forward to it.